Delightful card Marsha. I've been looking at that bundle and wondering how easy or difficult it is and whether I would use it enough to warrant the purchase. Your card is inspiring. 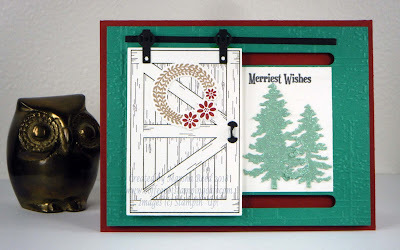 I love the colours you chose for the background and how the barn door keeps those pretty trees hidden until moved. Thanks for sharing this great card. Thanks, Penny! It was a fun stamp set and dies to work with. I love slider cards. I love that you used the Emerald Envy with your Cherry Cobbler, Marsha. You have the Christmas colours with a difference. Certainly I wouldn't have guessed the two colours would compliment each other so well. 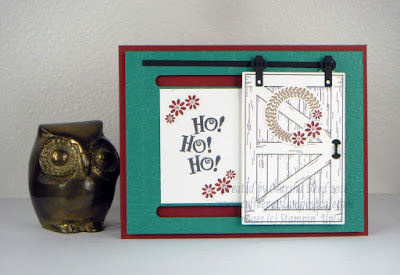 Love the way you've used that Barn Door bundle. Having the two sides to the card makes it feel as if you're getting double the card. Love it! Thanks, Heidi! I really like those colors together now that I've discovered that. And, I'm going to enjoy that Barn Door Bundle, too.